Which they were, both on the individual side and on the total production side. Again, recall the rules of this particular game: 8 ounces of cloves for each of four varieties, all planted under the same conditions (all at the southern ends of the garden beds so theoretically, they all got the same amount of sun and I watered all of them several times during dry spells early on). Now, all of these varieties were described in the catalog as ‘mid-season’, but Susanville was definitely earlier in terms of maturity; the other two varieties are dying now as well, so from that aspect, Vietnamese Red and the last two varieties are more of a piece than Susanville, but we will see how they do when we harvest them. From a production standpoint, Vietnamese Red did a great job – 8 ounces in the ground; 3 pounds, 2.5 ounces harvested. Now, this might not seem like such a huge difference from Susanville, which produced 2 pounds, 14 ounces. But it IS 8.7% difference. On the quality side, Vietnamese Red came on better than Susanville as well. One of my quality measures (and someone else might have a totally different measure; it all depends on what you are looking for in terms of garlic cloves)is clove size and ease of peeling off the skins and membranes. I treated both Susanville and Vietnamese Red exactly the same after harvest – a good scrubbing and dunking to remove all the dirt, cut the bulbs with one inch of stem left, and 24 hours in the greenhouse to dry. Then a total weighing and an individual weighing of all the bulbs to see how much variation there in in terms of size. Not only was there more garlic, total, there were more truly large bulbs – Susanville’s largest bulbs (and there were only two of them) were 2 and 5/8 ounces. In the Vietnamese Red, there were 6 bulbs over 3 ounces each, with the largest one being 3.5 ounces. In terms of peeling, the Vietnamese Red slipped the skins and membranes extremely easily; I didn’t end up having to pick little bits of skin off the cloves, which I find a very annoying undertaking. Finally, in terms of clove size, there was much more variation in terms of clove sizes within bulbs. Now, some cooks might not have any issues with this, especially if they just want a teeny bit of garlic flavor, but we use a LOT of garlic here at Chez Siberia and having to peel weeny little cloves just makes your old Aunty want to put her head through the wall. So, having garlic bulbs with 12-15 cloves each, where all the cloves are basically the same size, and there are no little weeny ones in the center is a BIG DEAL. Finally, for anyone out there scratching their heads, and asking themselves, “Why the hell is Aunt Toby peeling all the garlic at once?” Has she gone ’round the bend’ at last? Ah, my little munchkins – this is one of Aunt Toby’s cooking secrets. Years ago, when Aunt Toby was much, much younger and just a munchkin at cooking herself, she ended up, as many people do, with a garlic bulb in one of those ‘keepers’ (a name I find rather amusing since they don’t really ‘keep’ the garlic, do they? ), all sprouted out and yucky. And time after time, she would end up throwing the mess onto the compost heap of life and feeling as if she’s wasted it. At the same time, she had taken up freezing blueberries on cookie sheets so that she could end up with Ziplock(tm) bags of individually-frozen fruit. And that system worked very well, so she decided to try that to see if the garlic would work well frozen. And it DID! Now, I have found, much to my delight (because freezing the cloves on the cookie sheets makes the cookies taste a bit garlicky later), that I can just, after peeling the garlic cloves, throw handfuls of them into Ziplock(tm) bags, squeeze out the air and fish out as many as I please later on. And they stay individual in the bags that way as well. 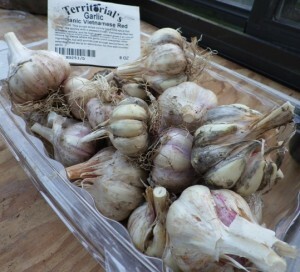 And that way, I don’t end up with all sprouted out garlic bulbs and no garlic to use. Posted in: Food, Raising It, Uncategorized. I have never tried to freeze garlic cloves. Do they retain their shape and color and texture? Since garlic is usually IN something, it probably doesn’t matter, but I’m curious. I’ll have to try the freezing method, someone else mentioned it to me recently and it went in one ear and out the other (an all too frequent occurrence these days). 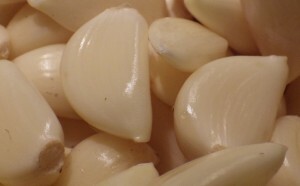 The “bite,” of the garlic flavor is only released when you smash a clove with the flat of a knife blade (or slice or chew it) which breaks the cellular structure and allows oxygen to combine with the naturally occurring chemicals in the clove. Therefore you’d preserve most of the flavor of garlic by freezing. I have ten varieties of hardnecks now and 2000 bulbs that are just reaching proper dryness in the curing process. A type called Bogatyr and another Metechi, very similar purple stripes consistently produce the largest bulbs. I grow porcelains, purple stripes and rocamboles, the first two usually being the better producers size and flavor-wise. Cover crops like buckwheat or oats, field peas and annual rye are sown as soon as the garlic is dug. Aside from controlling your buckwheat for seed production, it is considered an invasive in some places, all these scavenge or add nutrients and hold them from washing through to your subsoil and provide great additional sources of organic matter for the coming season. Molly – yes, the cloves retain their shape, color, texture, etc. What I do to use them is take however much I need out of the back – chop them up and either saute them in a little oil first or just throw them into the sauce or whatever. Works really really well.